"Explore new cultures, make new international friends, learn a new language, improve your CV/Resume, live and work in exotic locations, travel the globe, give something back to the world, make a positive difference in other people's lives"
A TEFL/TESOL course is your gateway to working anywhere in the world. With English becoming the "global language", trained TEFL teachers are in high demand, in primary and secondary schools, colleges, universities, and private language schools in countries from Thailand to Tanzania. An internationally recognized and accredited TEFL/TESOL course and certificate is included as part of your program package. This course will provide you with the skills needed to start your new career as an English teacher. You'll learn how to plan lessons and engage your class, tips for keeping discipline, and ideas for teaching grammar, vocabulary, speaking, listening, reading and writing. Most of all, you'll gain the confidence to walk into a room full of expectant faces and not run out again in tears! Our TEFL/TESOL course is very practical in nature. Modules cover a wide variety of teaching techniques and strategies, with a strong emphasis on using the communicative approach to language teaching. This TEFL/TESOL course is designed for native speakers with or without previous teaching experience who want to gain a qualification in Teaching English to Speakers of Other Languages (TEFL & TESOL). It also serves as an excellent complementary course for those interested in gaining a PGCE or teaching diploma, as well as a passport for those who just want to take a year off to travel. Since 2002, we have been responsible for setting standards within the independent ESL and TEFL/TESOL education sector. Our accreditation is held by dozens of ESL and TEFL/TESOL training providers in the UK and overseas. All our TEFL/TESOL providers have been rigorously inspected. Institutions that carry our endorsement and the WTA mark, therefore, represent some of the leading and most reliable private TEFL/TESOL courses and training providers around the world. Also on this website, you will find the latest information, updates and documentation needed for achieving and retaining accreditation. All courses are accredited and moderated by the International TEFL Organization. We are also institutional members of IATEFL (International Association of Teachers of English as a Foreign Language) Member No: 24458. Contrary to popular belief, there isn't any single international accreditation body for TEFL or TESOL.There are numerous independent organisations all claiming to be "the most accredited". International Recognition and practical teaching practice are much more valuable to ESL employers than just 'accreditation'. Our TEFL qualifications and courses are widely accepted and valued by employers around the world. They are internationally respected as the quality standard. TEFL/TESOL courses typically last anything from one day to one month. You can do an intensive weekend course, an evening introductory class, or an online course at your own pace. Most employers, however, will expect you to have done some actual teaching practice with real students, all of which is included in the ITO TEFL courses. The Cambridge ESOL TKT (Teacher Knowledge Test) is an optional extra online course and in-class exam. It focuses on the teaching knowledge needed by teachers of primary, secondary or adult learners of English, anywhere in the world. Awarded by Cambridge ESOL, part of the University of Cambridge, TKT is internationally recognized, highly respected and a benchmark for quality. This is an excellent addition to your TEFL/TESOL certificate course and will greatly enhance your job prospects, confidence and even your salary! Although you can study the course online, you must take the Cambridge ESOL exams at any authorized centre. There are over 2,700 centres in 130 countries. They must meet high standards of professional integrity, security and customer service, and are subject to inspection by Cambridge ESOL. You can take the exam in your home country. *An additional exam fee applies and is paid directly to the exam centre. The TKT course is not the same as a CELTA. Our 120-Hour TEFL/TESOL Courses can be taken 100% online or you can join one of our Advanced in-class courses over a 4-week period. Our internationally accredited TEFL/TESOL certificate courses are designed for those with or without any previous teaching experience who wish to gain practical experience in the methods of Teaching English as a Foreign Language, providing you with the perfect platform from which to begin your new career teaching English anywhere in the world! This TEFL course is very intensive, as we go through a great deal of content in a few weeks. However, If you approach the course with the right attitude and complete your assignments, you won't have any problems. You will enjoy a fun, highly instructive TEFL course, and you will gain an internationally recognized qualification for life! Our training centre directors have arranged the course schedule so that you will have most of your weekends free to relax and explore the local area. Classes run from Monday to Friday from 9am-4pm. Although weekends and evenings are usually free, you may have some teaching practice or homework assignments to complete. You have the opportunity to make a positive difference in the lives of people around the world. You get to immerse yourself in a foreign culture in a way no tourist could ever dream of! You will get job placement assistance once you graduate. You can expect to earn a generous monthly salary and a return on your program investment in around 3 months. You receive FREE lifetime membership to our Job Club, which will help you find a teaching job anywhere around the world, for many years to come. You earn a higher salary than other less qualified teachers. You learn how to teach all levels, giving you multiple skills and employment options. You undergo observed teaching practice to help build your confidence in the classroom, some of which may be teaching in a local school, monastery, or government office You can earn money while travelling. You can learn a new language, gain valuable work experience, improve your resume, develop your confidence, make and international friends. You will be able to take a break from the "rat-race" any time you wish from now on. You gain an internationally recognized TEFL/TESOL certificate that allows you to work in many countries around the world, for life! You can also gain a TKT certificate awarded by Cambridge ESOL, part of the University of Cambridge. Please note the course syllabus may vary slightly in each location. The actual number of study hours will vary depending on the number of students in each class. In any case the certificate you gain is 120 hours tuition, which meets the international certification standards recommended by the British Council. 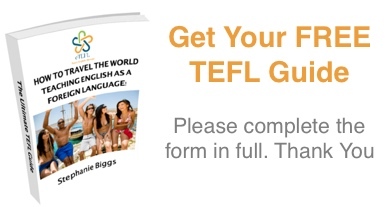 This is the most fundamental area of any TEFL/TESOL course. You will teach real students of English and put into practice the skills you learned on the course. You will undergo observed teaching practice, covering elementary to advanced level students, as well as one-on-one tutoring. You will also observe other teachers in action for 2-3 hours. Course trainers will guide you through the process of planning, preparation, delivery, and reflection and will provide you with constructive feedback on your performance. Even native speakers of English will surely have forgotten the grammar they learned in school. You will learn how to answer any questions or situations that may arise in a class. a) Grammar covers word classes, simple sentence elements; complex sentences and clauses; verb time and tense; aspect, conditionals, and modals; phrasal verbs; and voice. b) Phonology covers phonetics; word stress and intonation; sentence stress and intonation; rhythm and intonation; and connected speech. Trainees work with individual students on rapport-building, error analysis and correction, and addressing individual student needs. Three meetings with the student are required, including transcription and error analysis of audio and written samples, culminating in a 20-minute session observed by a trainer. Trainees sit a written examination and make a presentation of a prepared class. Many other courses will limit your observed classes due to the large number of trainees they take on. Having so many trainees and so few students makes it physically impossible for all their trainees to receive 6-hours. With a maximum of 16 trainees in our classes, you will have plenty of time to prepare for the practicalities of the classroom and overcome those first-time nerves in a controlled environment with the professional support of your tutor. Our TEFL trainers are highly qualified and very experienced in teacher training. They are all full-time employees, and most have been with us for several years. Being fully trained professionals with many years of experience with EFL classroom teaching, our trainers are both authoritative and informed. The training procedure for our trainers is extremely rigorous. Not only are the trainers expected to have teaching experience, they are also required to have teaching/training experience in more than one country. All our trainees pass the course. We will not let you fail, even if it means taking the course all over again! Our trainers will spend extra time with you as necessary and coach you in any areas where you are weak. Our goal is that you succeed. Our TEFL/TESOL courses are certified to meet international standards. Employers prefer to take on teachers who have completed a course of 120 hours, including observed teaching practice. Disclaimer: All information on this page was correct when published and is subject to change without notice. The course syllabus and content may vary in different TEFL course locations. All of our TEFL/TESOL training centres and online courses may be moderated by theInternational TEFL Organization as well as other accreditation bodies. The TKT certificate is awarded by Cambridge ESOL, part of the University of Cambridge.